Abu Simbel - The ultimate symbol of self-aggrandizement, Abu Simbel is a monument to Ramses the Great's boundless ego. He built it to celebrate his victory at Kadesh (which, as mentioned above, was likely a stalemate). Begun in about 1264 B.C., it took roughly twenty years to build and was constructed near the southern border as a reminder of Egyptian strength. It consists of two buildings, the Great Temple and the Small Temple. The Great Temple is dedicated to the gods Amon-Ra, Re-Horakhte, Ptah, and, of course, a deified version of Ramses himself. 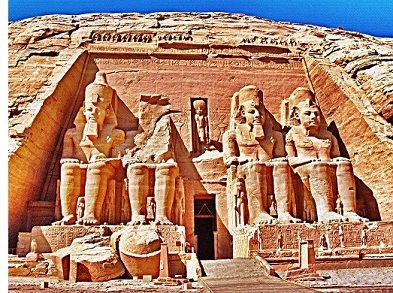 The entrance to the temple is guarded by four 66-foot tall (20m) statues of...Ramses. The interior of the temple contains a series of chambers accessed through a main hall which is supported by eight columns in the shape of...wait for it...Ramses (as the god Osiris). On the walls of the hall are scenes of the pharaoh in battle, including the Battle of Kadesh. Behind the first hall is a smaller second hall leading to three rooms, including the sanctuary. On the walls of the second hall are ritual offering scenes. The sanctuary contains an altar and a niche carved into the rear. In the niche are four statues of the deities to which the temple is dedicated. One interesting feature of the Great Temple is that it was originally built on an axis so that for two days of the year, one in February and one in October, the sun would shine through the entrance an illuminate the interior. The Small Temple is actually not dedicated to Ramses, but to the goddess Hathor as personified by Nefertari, Ramses' favorite wife. Even though it is smaller than the Great Temple, the statues of Nefertari are larger than the traditional size that pharaohs' wives were usually depicted, indicating the amount of respect Ramses had for her. The two temples were famously moved between 1964 and 1968 to higher ground to save them from being destroyed by the lake that was created by the building of the Aswan High Dam.